The future is happening today, and the most successful organizations will be those that understand the dynamics of the "big picture" in which their decisions are being made. This book describes how to understand and influence that picture. 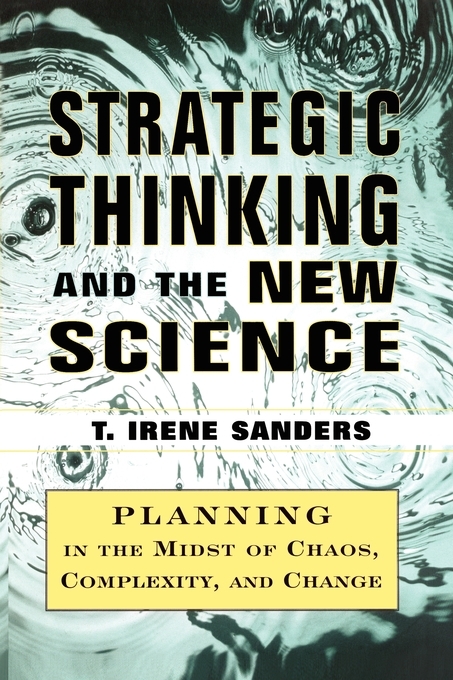 Irene Sanders pioneered the application of chaos theory and complexity to strategic thinking -- the most essential skill in today's fast-paced business environment. Now, in this straightforward, easy-to-read book, she shows how the most up-to-date strategic thinking is done, and how you can begin using it in your enterprise. Sanders' original and practical approach moves far beyond traditional forecasting, futuring and scenario-building. The new science of chaos and complexity has shown scientists and business professionals alike the importance of looking at the world as a whole system, rather than as a collection of deterministic principles. Consequently, the human mind -- through the integration of intuition and intellect -- is now recognized as the only information processor capable of understanding the level of complexity in today's global business environment. By engaging the mind's eye through the use of visual thinking, Sanders shows you how to develop insight about the present and foresight about the future, thereby allowing you to see and influence the future as it is emerging. The new planning paradigm presented in Strategic Thinking and the New Science is nothing less than a transformation of the science of business. For the first time in history, we have the knowledge, tools and techniques to develop visual thinking as the essential insight/foresight skill of the future. In addition to breakthroughs neuroscientists have made about brain-mind interactions, artists and psychologists are revealing the role of imagery in the creative process. And now, the new field of scientific visualization brings all of this information together with computer graphics to demonstrate how visual images can be used to engage our imaginations, enhance learning -- and stimulate our deeper levels of awareness. In this groundbreaking book, Sanders is the first to define the new model of strategic thinking -- a model that is bound to revolutionize organizations of all types as they begin to see and influence their futures -- today. You must first be on the path, before you can turn and walk into the wild. Imagine what it would be like if every day were just like the day before. Only one season, spring. Trees and flowers in full bloom. Children, the same children, play in the park; no births, no deaths. Politicians give the same speeches over and over. No new wrinkles, gray hair, or bulges at the waistline. The sweetness of spring fills the air and our hearts are open to all possibilities. Only there aren't any. In a world of sameness, the only possibility is that somehow something might change. Now imagine this same scene set in motion. Children grow up, we begin to see the signs of aging, and we and our loved ones leave each other by choice or by death. Conflicts arise. Businesses expand and contract. The sweetness of spring becomes the fullness of summer. Our hearts feel the ups and downs of all our experiences, and we realize that in a world of change the possibilities are endless. Every culture since the dawn of humankind has faced the challenge of explaining why and how things change. Where do stars come from? What causes the sun to push the stars aside and fill the morning sky with light? Why does a full moon gradually shrink into a crescent? Why do volcanoes erupt? Why was one tribe victorious over another? How do new tools come into existence? Where do new ideas come from? What causes disease? We live in a world of constant change, and the explanations about it are as varied and interesting as the cultures they reflect. In looking back, history reveals that the answers to these types of questions were shaped by the underlying worldview of each culture. For the earliest cultures it was observation and imagination, which grew into rich mythologies. The Greeks used a combination of mythology, philosophy, and science. Later, Christianity, Judaism, and Islam provided religious explanations. And now, modern science and its primary language, mathematics, are the dominant sources of our worldview. It's misleading to think that science can be understood in isolation from the social, cultural, and political contexts in which it developed. It's even more misleading to think of science as a timeline, the kind we all memorized in school; a straight line of names and dates attributed to specific events, discoveries, and theories. But it is important to understand how science has and continues to influence our view of the world. I prefer to think of the history of science as a collection of campfires -- campfires of thought -- dotting the social, cultural and political fields of their time. Imagine that each campfire represents the conceptual essence of those gathered around it. In order to appreciate the connections and relationships among these conceptual clusters, as well as their contributions to generations of future thinkers, we need an aerial view. From above, we see that some fires (ideas) burn brightly for a while and then go out; others never quite catch on; some become wildfires as they consume those nearby; in some places, sparks from existing fires ignite new ones; a few burn eternally; occasionally, twin fires burn like pillars of light until one grows stronger or the ground between them catches fire, creating a single column of light; some die down, then catch a gust of wind, flare up, and burn for a while longer; and others glow softly in the background, their embers keeping ancient memories alive. The history of science is a relatively new discipline, and as such there is still much to learn about the contributions of early cultures to the evolution of science. With that caveat in mind, the campfire image helps us appreciate the fact that there is an historical field or context in which new ideas develop. It helps us recognize the similarities as well as the diversity of thinking that developed in different parts of the world during the same time period. And it helps us appreciate the important impact that contact with other cultures and other schools of thought have on the spread and evolution of new ideas. Historians usually have a purpose or an agenda. In my case, it's to follow the theme of change from the scientific perspective, which I believe will help us understand some of our present-day dilemmas. By listening to the voices of those who came before us we'll understand how we developed our preference for linear, mechanistic thinking and the assumptions by which we live and work. And we'll begin to understand the limitations of this worldview. Beginning with a scientific retrospective will also help us understand the context in which the new science of chaos theory and complexity began to take shape, and why it is generating so much excitement. In that light, I invite you to ride with me through the fields of history visiting briefly the major campfires of thought leading to the present. Our view of history is rarely complete. New discoveries often surprise us by pointing to much earlier and higher levels of knowledge and skill than current theories suggest. For example, we now know that by the time Egyptian civilization made the transition to hieroglyphic writing its science, art, astrology, astronomy, and architecture were all well-developed. The span of human prehistory is enormous, covering the million or more years preceding the development of the first written languages, which appeared around B.c. 3000. Archaeological evidence is often fragmented, separated by continents, still buried, or destroyed by cataclysmic events or dramatic changes in the Earth's climate. Because of this, little is actually known about the worldview of those who lived before the time of written history. However, by studying the earliest written records, artifacts, and the stories that exist in oral traditions today, anthropologists and historians have found clues to the belief systems of those who lived just before and after the beginnings of recorded history. These early cultures saw the world as an interconnected whole in which man, nature, a variety of mythological characters, and many types of invisible forces worked together to bring the world into its present form. Each culture had an elaborate creation story and a collection of other stories that explained the natural, social, and technical changes leading to the present. In these prereligious cultures the gods were an immanent part of the universe, not transcendent as religious leaders would later proclaim. And as such, the deities played an active role in human affairs, and nature's extremes were seen as expressions of divine anger or benevolence toward humankind. Inconsistencies and contradictions were irrelevant as long as the stories satisfied questions about the past and supported stability in the present. For example, the origins of the world, its peoples, plants, and animals usually are attributed to the sexual activity and progeny of various gods and goddesses. The gods often fought among themselves. Even when killed and dismembered, a hero's body could be reassembled long enough to accomplish an important task. And to account for new tools or insights, stories were expanded to include the hero's use of the new "whatever" in his victory. In Western culture, we are accustomed to thinking of myth as merely fiction. But when viewed from the perspective of psychology, for example, rather than from those of anthropology or history, we see contemporary personal and interpersonal themes enacted in the mythological dramas -- love, betrayal, death, the struggle for power, and the search for wisdom. These universal or archetypal themes help explain the renaissance of mythology as demonstrated in the work of Carl Jung, Joseph Campbell, Robert Bly, Jean Shinoda Bolen, and Clarissa Pinkola Estés. Myths accounted for the mundane as well as the extraordinary, and in doing so they also represent the earliest cosmologies or beliefs about how the world works as a whole. There are a variety of stories telling how the world was formed out of its primordial elements. Each culture had its own version and specific names for the gods and goddesses who gave form to the formless. What most of the stories have in common is a description of the universe as a dynamic or constantly changing field of vital substances out of which the gods created life and all its forms. In the content of these ancient cosmologies, we catch glimpses of the conceptual gene pool from which scientific thought began to evolve. In the sixth and fifth centuries B.C., Greece became the first culture in which literacy played a crucial role. Writing allowed ideas and information to be stored, transferred, compared, supplemented, and critiqued. This accomplishment, along with the Greek skill of borrowing and integrating ideas from other cultures, laid the foundation for its spectacular achievements in many areas, but especially in philosophy and science. The Greeks borrowed mathematics from Egypt and Mesopotamia, now southern Iraq, where Pythagoras was said to have traveled in the fifth century B.C. From these same cultures they also borrowed developments in astronomy, pharmacology, and surgery. And its geographic location and trade routes provided contact with Eastern cultures and traditions. Philosophy and science began to emerge in the midst of this culture steeped in its own mythology and a mythologically based cosmology. Stories about Zeus and the other gods of Mount Olympus were a central part of Greek life, and they continued to be long after the development of a new, more intellectual approach to understanding the world. The word "philosophy" is a broad term with roots in both the Greek philosophos and the Latin philosophia, meaning love of wisdom. To take a philosophical approach to any subject means to prefer the methods of intellect and logic over experience and intuition. The early Greek philosophers developed this approach by first applying it to questions about nature and later to questions about politics, ethics, and a number of other subjects. The more specific word "science," derived from the Greek word episteme, or epistemology, and the Latin word scientia, means knowledge gained through careful and deliberate methodologies. Together, the closely related concepts of philosophy and science represent the cultivation of knowledge through reasoning, experimentation, critique, and proof. The word "scientist" first appeared in 1840. Until then, the person we would now call a scientist was identified by using the word "philosopher" hyphenated with the specific scientific discipline in which the individual worked, resulting in descriptors such as philosopher-mathematician and philosopher-geographer. In the sixth century B.C., ancient Greece covered a much larger territory than the Greece we know today, and these early philosophical developments emerged in its easternmost region or present-day Turkey. In this region, separated from the Greek mainland by the Aegean Sea, a group of innovative thinkers began a careful, more exacting or philosophical inquiry into the process of change. "Natural philosophy" or the "philosophy of nature" began to take shape as this group of radical sixth-century Greek thinkers started asking new questions about how one thing comes into existence and another is transformed. They wanted to understand what the world is made off what are its ingredients? how do they interact? They tried to understand the basic nature, characteristics, or principles at work in the world around them. They believed that all things work or change according to their basic natures. A volcano erupts in a certain way because that's what volcanoes do. The moon and stars move according to their natures. In other words, order was intrinsic. If everything behaves according to its nature, then the world is orderly and predictable. And the challenge, as they saw it, was to understand the basic nature of specific phenomena and to determine if generalizations or broad principles applied across phenomena. With this type of thinking, this group of philosophers and their followers made three important contributions toward the development of the scientific method. First, they asked new types of questions designed to help them understand the fundamental nature of the universe. What is the relationship between order and change? What exists before form? Is there a common "something" out of which all forms are created? If so, what is it? What are its characteristics? And what happens to it at death? Second, their answers eliminated the gods as the probable cause of natural phenomena. The belief in a world unpredictable and vulnerable at the hands of the gods was replaced by the belief in a more orderly and predictable world that could be understood by understanding its fundamental realities. And third, they began to develop a formal system of scientific inquiry. Theorists were expected to provide proof of the correctness of their ideas for review and critique. In other words, the quest for truth and the development of criteria by which to recognize it had begun. This type of thinking did not follow a straight line to the present. Like an epic mystery, the history of science is filled with false starts, dead ends, new clues, hidden passageways, startling discoveries, and a cast of characters to keep the story moving. Many schools of thought followed. The atomists in the late fifth century B.C. believed that the world was made up of tiny constantly moving particles, which came in a variety of shapes and sizes and out of which everything in the material world was constructed. In their view, life and all its forms are made up of these lifeless particles and life itself is a well-constructed machine. This mechanistic view of the world would fade under the influence of Plato and Aristotle, only to reappear stronger than ever in the seventeenth century. Pythagorean philosophy, emanating from the Greek colonies of southern Italy, introduced the idea that fundamental reality is numerical, not material. For Pythagoreans, numbers came first, then matter. Mathematics was their tool of choice for investigating the world. Questions about the nature of the world and the processes of change provoked questions about the reality of change. Shouldn't ultimate reality by definition be unchangeable? And if so, how could something unchangeable produce change? The possibility of such a paradox -- a world that is both stable and changeable -- sparked new theoretical conflicts between the concept of being and that of becoming. Heraclitus, who is credited with the saying that "it's impossible to step into the same river twice," believed that the universe is characterized by constant change. He argued that order or equilibrium results from the tension between opposing forces. Parmenides, who denied the existence of time, took the opposite view. Change is not possible. What exists now has always existed. From his perspective, even the experience of change must be overlooked in favor of a rational approach to reality. Others took compromise positions. Change and stability coexist. An underlying stability is present beneath our superficial experience of change. Another feature of these early debates were the ongoing questions about the role of the elements: fire, water, air, earth; the senses: color, taste, odor, sound, texture; and values such as good, evil, honor, justice, etc. Was fire the original material of the universe? If the gods created and guided the universe, what were their intentions? And, of what benefit were the senses in understanding fundamental reality? In the fourth century B.C., Socrates shifted the focus of philosophy away from cosmology and toward politics and ethics. But his disciple, Plato, influenced by his teacher and the Pythagoreans, continued to explore the underlying basis of reality. Plato envisioned two realms: a superior changeless realm of ideas and forms; and the ever-changing material world, an imperfect expression of this higher realm. Because the material world is transitory, he believed that true reality exists only in the realm of ideas and forms. Therefore, the world we see and experience through our senses is but a shadow of the true reality. To know the true reality, we must be freed from the senses. He believed that the senses are useful, but that the path to knowledge is reason. How did Plato's approach relate to the thinking of his predecessors? First, rather than a fiery cosmos, he believed in a realm of forms and ideas from which everything in the material world was derived. Second, he accounted for both change and stability by assigning them to different realms. Third, he placed the senses in opposition to reason. And finally, he believed that everything in the material world was a representation, although imperfect, of its perfect form in the higher realm. Because of this, careful observation of the material world would provide insights about the true nature of the universe. Plato disagreed with the earlier philosophical views, which attributed order to the inherent or intrinsic nature of things. This view of order, he said, excluded any divine plan for the universe. To explain his thinking, he used the image of a divine craftsman-mathematician who imposed order from the outside by using geometric principles to construct the universe. In what appears to us like a leap of imagination, he believed that each element -- fire, air, and water -- could be translated into a geometric shape based on the triangle, the tetrahedron, the octahedron, and the icosahedron respectively. He used the cube to represent earth and the dodecahedron, made of twelve pentagons and resembling an angular sphere, to represent the universe as a whole. In his view, creation was the result of various combinations of triangles. We would be tempted to say, "various combinations of these triangular elements," but Plato believed that triangles were the fundamental reality out of which everything is made. Here you can see how Plato's cosmology derives from his belief in the ultimate reality of shape and form. Change and diversity occurred through various combinations and recombinations of triangles. On the surface, Plato's cosmology appears somewhat mechanistic. But the difference between his view and that of the atomists, who believed that the universal substance was lifeless, is that he also believed that the creator-craftsman created a living universe with a soul, which is responsible for its well-being. It's helpful to remember that Plato believed that man and all material objects are imperfect replicas of the perfect world of shape and form. So, if man has a soul, then the universe is a more perfect being with a more perfect soul. His was an animated universe, a living geometrically perfect cosmos. He also believed that the universe is supported by various noninterfering gods whose role is to ensure stability and order. In other words, he restored the gods to account for order, the very reason that the earlier philosophers had removed them. And by using geometry to describe the world, he was a proponent of reducing nature to numbers. Through Plato's work and the work of those who came before him, we see the struggle to create a conceptual framework within which to understand a world characterized by both order and change. Plato's worldview dominated the thinking of his time, but Aristotle (born in 384 B.C. ), Plato's student, disagreed with many of his teacher's beliefs and set in motion another worldview, which would dominate philosophical and scientific thought for almost two thousand years. Aristotle's greatest achievement was that he developed a formal system of logic and a set of principles, which he applied to a wide range of disciplines, including biology, cosmology, meteorology, astronomy, and what would later be called theology. His interests were broad and his thinking complex, thus accounting for his influence across so many generations. Aristotle did not accept Plato's view that the senses are stumbling blocks to knowledge; nor did he believe that the material world is an imperfect representation of a more perfect external reality. In his view, the material world is reality, and knowledge of it begins with experience and experience begins with the senses. Like the earlier philosophers, Aristotle believed that natural objects, as opposed to man-made objects, behave in certain ways according to their natures. He believed that through observation and experience (empirical knowledge) and the use of inductive and deductive reasoning one could understand the basic nature of things. He believed that all objects are made of both form and matter. But unlike Plato, who believed that form is foremost and separate from matter, Aristotle believed that they are inseparable. For Aristotle, the word "form" meant not only shape, but included other characteristics or qualities such as color, texture, and temperature. And matter is the substance through which these qualifies become recognizable. Qualifies do not exist without matter, and matter is differentiated by its qualities. Therefore, Aristotle's world was primarily qualitative rather than quantitative, as distinguished from the mathematical worldview preferred by Plato and the Pythagoreans. This helps explain why he favored observation and description over experimentation. Aristotle believed that the form an object takes is determined by its function. To understand the shape of a foot, for example, we would have to understand the function of feet: weight-bearing, balance, and locomotion. He also believed that, while form may change, matter remains. Change is possible, he said, because matter contains the potential for change. For example, a tulip bulb contains the potential for becoming a tulip. The characteristics or qualities of the tulip change as it fulfills (grows into) its potential, which it does according to its individual nature as well as the general nature of tulips as differentiated from other types of flowers. He believed that the material world is changing constantly because every object is in the process of becoming what it is intended to become, a type of self-actualizing process. In other words, change occurs as objects move toward their final outcomes according to their natures. Aristotle's accomplishments were enormous. His views dominated the philosophical and scientific thinking of many disciplines for almost two millennia, and endure even today. Yet, it is his cosmology, or rather Galileo's break with it in the seventeenth century, for which he is most often remembered. Aristotle believed that the universe was eternal; no beginning, no end. He believed that the Earth was round rather than flat, but he also believed that the Earth was the center of the universe, with the sun, moon, stars, and planets revolving around it in perfect circular orbits. He imagined that the universe itself was a giant sphere divided into two realms, terrestrial and celestial. The Earth, and the region between the earth and the moon, made up the terrestrial realm. Everything above the moon was in the celestial realm. Each realm operated according to a different set of principles. The terrestrial realm, made out of the four elements -- earth, air, fire, and water -- was subject to the principles of form and matter and, therefore, characterized by constant change. The celestial realm, by contrast, was made of a perfect and unchanging fifth element, which Aristotle called "aether." (Aether is the poetic name for the clear upper air breathed by Zeus and the other gods of Mount Olympus in Greek mythology.) According to Aristotle, everything in the celestial realm was perfect and followed perfect unchanging cycles. Motion in the celestial region was not the same kind of motion experienced in the terrestrial region. According to Aristotle, the Earth and all objects in the terrestrial realm were stationary except when seeking their natural place in the universe (natural motion) or when forced to move (forced motion). He believed that an object that has been forced or caused to move eventually would resume a resting state, until forced to move again. Resistance was also a factor in forced motion, influencing both time and distance. And because Earth was at the center of the universe, each object moved toward its natural place in relationship to that center. Motion in the terrestrial realm was rectilinear and characterized by breaks and interruptions. In the celestial realm, things were different. He believed that motion in the celestial realm was not forced but inspired by the perfection of a supreme and changeless diety whom he called the "Prime Mover." He believed that celestial motion followed his theory of function, or final outcome. According to Aristotle, the sphere and its counterpart, the circle, represented perfection. Therefore, the heavenly bodies, assigned to a series of concentric spheres, moved in perfect continuous unchanging circular orbits, because they were attempting to fulfill their potentials. Because perfection was the final outcome for heavenly bodies, he believed that perfect and continuous circular motion was the only type of motion found in the celestial realm. If we could animate Aristotle's view of the universe, what would it look like? Imagine that you are in a hot air balloon hovering above a baseball stadium on a clear summer night. Below, you see a game in progress with players on the field and one at bat. The pitcher throws the ball, you hear the crack of the bat as the batter swings, and the ball goes flying through the air. In the stands you see the fans jumping up and down, shouting at the players, talking to each other, and eating. And you hear the roar of the crowd as a player slides into home plate. You are also aware that surrounding the stadium are the night lights, activities, and sounds of a bustling metropolitan area. And in the distance you see a shooting star streaking across the horizon. From the balloon, you observe all types of forced and discontinuous terrestrial activity. Now, look up at the sky. Above the sights and sounds of the city below, you see the moon. And beyond the moon, you see the celestial realm with distant stars and planets rotating around the Earth in perfect circular orbits. Now, close your eyes, take a deep breath, and imagine the sense of comfort you would feel in believing that the Earth is the center of the universe, sheltered beneath a canopy of unchanging heavenly perfection. Aristotle's cosmology was quite complex. It was modified in the second century by Ptolemy, who developed a whole cosmological model, which served as the basis for elaborate celestial maps. The Aristotelian-Ptolemaic cosmos was based more on conceptualization than on observation and experimentation, which would be its downfall centuries later. The move away from the Aristotelian worldview is often cited as the point of demarcation between medieval science and the beginning of modern science, ushered in by the Scientific Revolution of the seventeenth century. From these campfires of thought, we can identify the major philosophical and scientific questions, and the poles around which the answers revolved. What is the fundamental nature of reality? Lifeless atoms floating in the void of space (mechanistic) or a living material (organic), perhaps with a guiding intelligence of some sort? What is the nature of change and its relationship to stability and order? Intrinsic or extrinsic? What is the best way to answer these questions? Is it with qualitative methods such as observation and description or by applying the quantitative methods of mathematics? In various forms these debates raged on for centuries, against the backdrop of enormous social and political change, including the expansion of the Greek empire and its eventual demise; the rise and fall of the Roman Empire; the birth and expansion of Christianity in the West and Islam in the East; relentless political upheaval in Europe; and the institution of schools and universities throughout the Western world. Before we go back to the major questions, I want to discuss briefly several aspects of the interesting and important relationship of the Church to science. By the time of Julius Caesar's death in 44 B.C., the Roman Empire included most of Spain as well as present-day France and England. It extended down across the Mediterranean Sea into North Africa and Egypt, across Greece and the Greek territories, and into present-day Turkey. Virtually the entire Mediterranean basin was Roman territory. The success of Rome in conquering Greece meant that Rome began to absorb the Greek intellectual traditions. Knowledge of Greek philosophy became a status symbol of the Roman upper class, thus popularizing and supporting the translation of Greek texts into Latin. In the first century A.D., Christianity began to spread through the Roman Empire, north from Jerusalem along the coast of the Mediterranean Sea and west across present-day Turkey and Greece and into Rome. In the beginning, Christians faced resistance and contempt from Greco-Roman intellectuals and the threat of persecution from the Empire itself. Eventually, however, resistance turned to toleration, and by the end of the fourth century Christianity had become the state religion. By forming an official alliance with the Church, the Roman state hoped to strengthen its control and unify the Empire. The early Christian communities took many forms, depending on the geographic location and culture of its earliest followers and their pre-Christian beliefs about the nature of man, god, and the universe. This created a great deal of diversity among the early churches and led to disputes about the nature and practice of Christianity. Assisted by a succession of Roman emperors, the Latin Church eventually consolidated its power in Rome. The local church of Rome and its bishop assumed a preeminent role among the loose-knit network of churches throughout the Empire. From its center in Rome, the Church worked to resolve doctrinal disputes among local churches by developing a unified doctrine and a disciplined organization. The Church of Rome based its religious authority on the belief that it was founded by the apostle Peter, who was later martyred and buried there, and on the belief that he established a line of succession and communication through the bishop of Rome. The Petrine primacy, acknowledged today by the symbolic importance of St. Peter's Basilica in Rome, is what fundamentally distinguishes Catholicism from other forms of Christianity. Because the masses were relatively uneducated, the intellectuals of the early Church assumed a powerful role as they worked to develop a unified Church doctrine, respond to the intellectual works of the pre-Christian Greek philosophers, and spread the teachings and mission of the Church throughout the medieval Western world. In other words, the Catholic Church, headquartered in Rome, assumed three important roles: keeper of the faith; translator of important written works, including the Bible and the Greek classics; and educator of the masses. This combination gave the Church an enormous amount of control over the thinking and belief system of its followers. Formal education remained a privilege of the upper class through the duration of the Roman Empire. As Rome's influence began to fade, and Western civilization entered a period of social chaos, the availability of educational opportunities shrank. Christian intellectuals retreated to monasteries in which they could pursue their interests, while the rest of Western society struggled with social and political turmoil and the plagues that ravaged whole regions. The Dark Age of scientific and intellectual pursuit (approximately A.D. 500-1000) had descended. During this time, however, some monastic traditions allowed and others even encouraged their monks to continue annotating, transcribing, and translating ancient texts while at the same time building libraries filled with their own scholarly works. In other words, monasteries provided a safe place through which many of the classics survived, while also providing a safe haven for Christian intellectualism. During this period, medieval Western civilization was anything but civilized, as generations of warlords fought for control over each others' territories. Eventually, feudal states began to emerge out of territorial conquests, paving the way for the rise of nations. Throughout this time the Church remained the most stable institution in medieval life. Scholarly activity and education began to reemerge during the reign of Charlemagne, whose kingdom, by the time of his death in 814, extended through Germany, France, Switzerland, and Austria, and into Italy. His educational reforms were undertaken to strengthen both the Church and the state. With this purpose in mind, education was conducted in church schools established throughout his territory. The transition period in which learning began to spread from the monasteries into society and the Renaissance, or rebirth of intellectual pursuit, covers approximately four and one-half centuries, 1000-1450. By this time, the Catholic Church, the de facto heir to the Roman Empire, was the most powerful institution in medieval Europe. During this 450-year revival, Latin and Greek texts were recovered, new texts trickled in from other parts of the world (primarily Islamic texts and their commentaries on the work of the Greek philosophers), and the Church tried to assimilate these important but nonconforming intellectual works into its doctrine. Aristotle's work, because of its breadth and intellectual rigor, assumed a central role in the reemergence of philosophy and science. His concept of the universe, with Earth at the center, suited the Church's desire for unity and power. So, his view of the cosmos was adopted by the Church, not because of its scientific underpinnings, but because it supported the Church's view of itself at the center of society. In other words, the Church institutionalized the Aristotelian worldview. To question it was to question the Church, an act for which one could be charged with heresy. In the twelfth century, afraid that its power was being eroded by critics, doubters, and "new thinkers," the Catholic Church established the Inquisition to ensure uniformity of religious belief in European society. By punishing those who questioned its doctrine and authority, the Church hoped to maintain control over and stabilize a society, which was increasingly more mobile and open to outside influences. The Inquisition was a powerful weapon of the Church for seven centuries, reaching its peak in the fifteenth and sixteenth centuries. Its demise was set in motion by the Protestant Reformation, which spread across Europe in the 1500s, and by the French Revolution in 1789, which promoted freedom of religion and religious tolerance. The Inquisition continued to be used sporadically into the nineteenth century and was finally abolished by the Holy Office in Rome in 1852. The fact of the Inquisition demonstrates clearly the power of the medieval Church and its desire to control the behavior and thinking of millions. Individuals engaged in any type of activity that threatened to undermine the Church's authority, including those exploring new scientific ideas, were subject to its tortures. In the seventeenth century, Galileo, the "father of modern science," was threatened with torture for promoting the Copernican theory that the Earth revolves around the Sun, contrary to the accepted Aristotelian theory that the Earth was the center of the universe. He was forced by the Church to renounce his own views. In the end Galileo's views were accepted, but he was not absolved as a heretic until 1984, over three hundred and fifty years later! The struggle between science and religion to understand and unravel their relationship has been long and complicated, and extends into the present. The contemporary argument over educational curricula, between those who support creationism, or a literal interpretation of the Bible's seven-day creation story, and those who accept the theory of evolution is a modern-day version of this historic dilemma. The Scientific Revolution of the seventeenth century was not an event but rather a period of transition in which open questions from the past were resolved and revolutionary new ideas began to take hold. Some campfires of thought were extinguished forever, while others were ignited and still light the scientific landscape today. In his essay "Statistical Expectations," Daniel Boorstin writes, "The whole advance from ancient to modern science has often been summed up as a movement from qualities to quantities." Indeed, by the time the seventeenth century arrived two separate but converging movements were already underway -- the mathematization of nature and the development of a mechanical philosophy -- which would eventually replace Aristotle's natural philosophy. While there were many who contributed to this revolution in thinking, it was the works of Johannes Kepler, Galileo Galilei, René Descartes, Christiaan Huygens, and Sir Isaac Newton that dominated and completed the transition from medieval science to modern science. And two new instruments of observation, the telescope and the microscope, gave scientists the tools they needed to push their thinking forward. The intellectual milieu of seventeenth-century Europe was diverse and volatile. Tension between Protestants and Catholics; an increase in the availability of printed texts; a growing number of educated people; an increase in the number of individuals studying philosophy, science, and theology; and, the expansion of knowledge through stories and objects brought back to Europe by travelers and explorers created fertile ground for new ideas. It was as if the ground heaved occasionally from the lava flow of creative tension just below the surface. Eventually, new ideas began to break through, and the ensuing eruption was dramatic enough, even at the time, to look like a complete break with the past. But the seeds of this revolution, like all others, were sown in a field of growing discontent. The old answers did not respond adequately to new information and new questions. So, it was precisely this tension between the old and the new that gave form and substance to the rapid advances that took place in this time period. While Aristotle believed that mathematics had an important place in science, he believed that there was a difference between mathematics and the reality of the changeable world he wanted to understand. Plato and the Pythagoreans, on the other hand, believed that nature was constructed according to geometric principles and therefore required a mathematical approach to understanding. So, while Aristotle's cosmology provided an overarching conceptual framework for thinking about the universe as a whole, the Platonic-Pythagorean approach evolved in parallel as a way to describe the invisible principles at work behind visible phenomena. By the end of the seventeenth century, Aristotle's natural philosophy had been replaced by mechanical philosophy, which viewed nature as a huge machine whose underlying mechanisms could be understood and explained. Eventually, mechanistic thinking converged with the Platonic-Pythagorean approach to form a mechanistic-mathematical view of nature, epitomized by the metaphor of a "clockwork" universe. This transition was set in motion before the end of the sixteenth century by Nicolaus Copernicus, a Polish priest, who theorized that the Sun, not the Earth, was the center of the universe. Copernicus' work was published in 1543, but it went relatively unnoticed for over fifty years, until Galileo Galilei, an Italian astronomer, and his German contemporary, Johannes Kepler, undertook the challenge of confirming the truth of the Copernican system. It's unlikely that they ever met, and in many ways their views were contradictory. Nevertheless, they were kindred spirits and together their work completed the revolution in astronomical theory started by Copernicus. In the Copernican system, not only was the Earth not the center of the universe, but neither was it stationary. The Earth had two motions: a daily rotation around its own axis and an annual rotation around the Sun. This radical proposition raised a whole set of new questions about motion in the heavens. In the second half of the sixteenth century, astronomers observed a new star and a comet that appeared to be in the region beyond the moon, the celestial region, which was thought to be unchanging. This, along with Copernicus' theories, convinced Kepler that Aristotle's celestial spheres did not exist and that other explanations must be found for planetary motion. He devoted his career to developing new theories to explain celestial motion. Like Copernicus, Kepler believed that the universe is constructed according to geometric principles, and his work reflected his desire to provide proof of its geometric structure, while at the same time uncovering the physical causes behind observable phenomena. Kepler was the first to propose that the same set of mechanical principles applied to both the celestial and terrestrial realms. He eventually proved that the orbits of planets are ellipses, not circles. He demonstrated that the planetary system does have a geometric structure. And he posed new questions about the type of forces that hold the planetary system together and cause the rotation of planets around the Sun. In other words, he shifted and expanded the theoretical framework of astronomy. His theories were dramatic and unsettling, even to him. By supporting Copernicus' theory of a heliocentric or Sun-centered universe and by rejecting the concept of celestial spheres, Kepler shattered, at least theoretically, the view of the universe that had been accepted without question for two thousand years. But it was Galileo who provided proof of the correctness of these new ideas and drove the final wedge between the Aristotelian worldview and the thinking that would replace it. Beginning in 1609, observations with his new telescope convinced Galileo that not only was the Sun the center of the universe, but that it was imperfect and changeable, much like objects in the terrestrial realm. This led him to question the accepted belief in two sets of rules, one for the celestial realm and another for the terrestrial realm. He too proposed that both operated according to one set of principles. But unlike Kepler, who focused on understanding celestial motion, Galileo focused on terrestrial motion. Without an explanation of how the Earth could be spinning while we are standing still, this new view of the universe, which violated common sense, would never be accepted. Galileo's explanation had two major components: the concept of inertia, that an object set in motion will continue to move with uniform velocity until something acts to stop it; and the separation of motion from the Aristotelian idea of essential natures. In developing his theory of motion, Galileo proposed a whole new mechanics to explain it. According to Galileo, objects are indifferent to motion. On a rotating Earth, motion is an object's natural state. The motion of the Earth's rotation is not obvious because it is an experience shared by all. It does not act independently on any object, but uniformly on all objects. All objects experience a uniform horizontal movement, which relates to the Earth's circular rotation. It is eternal and imperceptible. Think about an airplane ride. Everyone and everything on the plane move in the same direction at the same time and speed. On a clear day, only the sound of the plane or a look out the window give you a sense of motion. You are much more aware of your individual movements and the movements of other passengers than you are of the plane's motion, unless of course it runs into local air turbulence. In other words, according to Galileo, a hat stays on your head because it shares the same unvarying motion as all objects on Earth. Only local motion or a change in geographic location is perceptible and requires an explanation. Objects are passive, and a change in location (local motion) is caused by external forces, not internal causes, essential natures, or unique qualifies, as described by Aristotle. By focusing only on local motion and by separating motion from essential natures, Galileo shifted the study of motion from causes to forces, and by doing so dismissed a large part of Aristotle's natural philosophy. Galileo, like many others, believed in the importance of mathematical reasoning and used geometric ratios to express his theory of motion in terms of velocity, acceleration, time, and distance. So, in stripping away the qualities that Aristotle enjoyed exploring in favor of the quantifies that remained, Galileo was able to make his greatest contribution to modern science: mathematizing the study of motion. With his theory of motion, Galileo succeeded in answering the major objections to the Copernican heliocentric universe. Public acceptance was still slow, but without Galileo's work it would never have been possible. His work not only laid the foundation for acceptance, but it also established the basic physical principles and questions on which modern science is based. The deconstruction of the Aristotelian worldview paved the way for other dramatic changes. However, only in retrospect do these changes seem to create a coherent and direct path to the present. In fact, many modern historians reject this artificial sense of coherence, preferring instead to examine the various threads, themes, or campfires of thought that contributed to the shift in thinking known as the Scientific Revolution. For our purposes, it's the outcomes of this historic period and their impact on our thinking that are important. Therefore, the following summary is organized according to themes, with references to individuals or groups of individuals who made important contributions. In Aristotle's natural philosophy, change was the result of a self-actualizing or becoming process through which natural objects fulfilled their potentials. An acorn becomes an oak tree and a tadpole grows into a frog, each according to its nature. Aristotle believed that one could understand the basic nature of things by observing and describing this process. His was an orderly, dynamic, and purposeful world in which nature played an active role. Over the centuries other forms of natural philosophy appeared. In the sixteenth century, Renaissance Naturalism was a popular school of thought, in which nature was believed to possess a living spirit filled with mysteries unknowable to man's intellect. To its practitioners, the magnet, with its mysterious powers of attraction, was an example of nature's occult forces and hidden powers. Although different in many ways, Aristotelian natural philosophy and Renaissance Naturalism shared a belief in nature's active participation in the world through the interconnectedness of mind, matter, and spirit. However, opposition to this view of nature began to grow, reaching its peak in the seventeenth century, and René Descartes was its most influential critic. While Kepler and Galileo both used mechanical explanations to describe the Copernican universe, the move toward an organized mechanical philosophy appears to have been a spontaneous reaction against animism and the attribution of humanlike qualities to nature, which according to its opponents contributed little to science and its understanding of the world. For Descartes and others, the machine metaphor was a much more powerful tool for understanding nature. Although no one can totally escape the influence of the past, in his mind at least, Descartes made a clean start. The cornerstone of Cartesian mechanism was the separation of mind from matter. In taking this dualistic approach, Descartes expunged every trace of intelligence and life from nature, viewing it instead as passive lifeless matter to be acted upon by outside forces. He believed that all matter, including the human body, operates like a machine with mechanisms that are understandable by the mind's rational intellect. In separating mind from matter, Decartes depersonalized knowledge, thereby creating a chasm between one's experience of reality and reality as interpreted by science. He separated objective reality from the subjective experience of reality. Descartes did not attempt to develop new theories for natural phenomena. Instead, he devised new explanations or interpretations for known phenomena, using mechanical descriptions. In his book The Construction of Modern Science, Richard Westfall describes Descartes' approach succinctly: "Earlier philosophies had seen nature in organic terms. Descartes turned the tables by picturing even organic phenomena as mechanisms." The clock, because of its central place in European society, became the metaphor of choice for explaining the mechanics at work behind the visible world. The shift from natural time, based on seasonal rhythms and the Sun, to mechanical time, divided into equal hours and minutes, was hailed as an enormous technological accomplishment. Today tourists are still charmed by the old elaborately designed clocks and clock towers found throughout Europe. But this shift, from natural to man-made time, unwittingly gave the clock machine control over our thinking about and experience of time. Nevertheless, it was seen as an example of man's ingenuity and his ability to understand and harness nature. So, the clock, with its uniform motions and occasional irregularities, became the perfect metaphor for nature. By the sixteenth century, it was common to find the inner workings of a clock housed behind its face and other exterior time-telling features. Thus, the hidden clockworks represented nature's hidden mechanisms. And the visible movements of the clock, which often appeared animated and intelligent, represented nature's inanimate extension of its mechanical parts working together. In his book The Scientific Revolution, Steven Shapin describes the clockwork metaphor: "There might be an intelligent agent in the universe standing in the same relation to nature as clockmakers to their clocks, but one was not to confuse the inanimate product of intelligence with intelligence itself." Just as a clockmaker assembles the parts of a clock to complete his overall design, so are nature's parts assembled into a complex inanimate design. The mechanical philosophy became irresistible in its simplicity and apparent ability to explain complex phenomena. The body was described as a human machine with the heart as its central pump. The universe was described as a vortex with centrifugal forces and counter-pressures. And according to Descartes, magnetism resulted from the movement of screw-shaped particles through the Earth's core. Mechanical philosophers also attempted to answer the question "What is matter made of?" Descartes believed that all matter was made out of three basic elements -- fire, air, and earth -- configured into different sizes and shapes. According to Descartes, all of nature could arise from various combinations of these three basic elements. Others believed that the universe was made up of tiny particles of various sizes, known as corpuscles, which arranged themselves into clusters to create different types of matter. Atomists believed that tiny, invisible, indivisible bits of matter were the basic material out of which everything was made. In 1905, Einstein's description of Brownian motion -- the irregular, random motion of fine particles of dust suspended in a liquid -- helped to decide the debate in favor of the atomists. But now we know that atoms are made up of even smaller particles. So, what are the basic building blocks of nature? At the time of this writing, scientists believe the answer is quarks! Many modern-day business practices are still based on this mechanistic, building-block approach. In the early days of Total Quality Management, fishbone diagrams filled whole walls as organizations tried to identify and understand their dysfunctional parts. And today, reengineering teams examine even the smallest details of a business's operations, hoping to streamline and cut costs at every turn. It's not that these efforts aren't useful. The problem is that too often they are disconnected from the context, dynamics, and overall direction of the organization. Recently, a senior executive with a large metropolitan health care system told me, "At the moment, we have four reengineering teams working in our system and I don't know that we can ask our managers to start a strategic planning effort in the middle of reengineering." My response was to ask, "Then how do you know whether or not you're reengineering the functions that are most central to your future success?" In addition to being disconnected from its strategic directions, a focus on the pathology of its parts may lead an organization to overtreat a perceived illness at the expense of its future energy needs and potential. Shortsighted downsizing may immediately strengthen an organization's bottom line, while at the same time reducing its ability to respond effectively to sudden changes, crises, or unexpected opportunities. In other words, a mechanistic approach may be debilitating, futile, or even deadly without a strong connection to the big picture. The Platonic-Pythagorean tradition, dating from the fourth century B.C., promoted the belief that the universe is constructed according to mathematical principles. This belief -- that mathematics would be the key to understanding and expressing the underlying structure of the universe -- influenced the thinking of philosophers for centuries. In the seventeenth century, the popularity of this approach paralleled the development of mechanical philosophy, and you can see attempts by Kepler, Galileo, and others to describe the mechanics of motion in mathematical terms. Add this to Descartes' emphasis on matter as distinct from mind, and you have the framework of seventeenth-century science: the study of matter and motion or, more accurately, the study of matter in motion, and the search for nature's hidden order. These two interests did not always fit together easily. Few doubted that nature could be studied mathematically. But because a mathematical description is always an idealized account of natural phenomena, the more pressing questions concerned its accuracy and the propriety of using it to capture nature's realities and complexities. Was the creator a mathematician or was there a middle ground between the utility of mathematics and the uniqueness of the real world? The idea that nature could be studied mathematically gave confidence to its proponents, who eventually won the debate. Many, including Dutch scientist Christiaan Huygens and English mathematician Sir Isaac Newton, worked to perfect the mechanics and mathematics of motion. In his work Philosophiae Naturalis Principia Mathematica (The Mathematical Principles of Natural Philosophy), published in 1687, Newton succeeded in joining these twin pillars of scientific thought. Newtonian mechanics, often described as the culmination of the Scientific Revolution, created a new philosophy of nature in which nature's machinery follows mathematical principles. In the Principia, laid out in three books, Newton unified celestial and terrestrial motion under one set of mechanical principles that could be expressed mathematically; proposed new laws of motion, including his well-known third law, which states that for every action there is an equal and opposite reaction; proposed that all motion is linear; and theorized that the universe is infinite, not finite. He resolved many difficult questions whose answers had eluded other mechanical philosophers; took mechanics into areas of science that had seemed out of its reach, including fluid dynamics; and was the first to describe the forces of universal gravitation. In this wide-ranging treatise, Newton established the theoretical framework for modern science and raised questions that would occupy scientists into the present. The distinction between science and society used in the title of this section is itself a product of the transition in thinking that took place during the period of history known as the Scientific Revolution. In many ways, philosophers and scientists had always been separate from the mainstream, because their interests took them into more esoteric areas of questioning and thinking. But they remained connected to the experience of everyday life, because it was the laboratory in which they worked. As long as the senses were appreciated as valuable tools of science, there was a link between daily life and the extraordinary world of ideas and concepts used to explain its mysteries. That connection was broken by Descartes, who separated mind from matter. Cartesian dualism discounted sense experience and empirical evidence in favor of objective reality as defined by the rational analytic mind of the scientist. In other words, science claimed a superior role in describing "the ways things really are" as opposed to trusting "what we know from our own experience." The advertising phrase "My doctor says, Mylanta.®" is a modern-day example of this belief in science's superior knowledge. Meanwhile, the current mind-body-spirit movement is reminding us of an important connection that was lost centuries ago. This dualistic perspective is part of the legacy of the Scientific Revolution, as are the central role of mathematics in science and our preference for mechanistic thinking. In Nature's Numbers, Ian Stewart describes the important role of mathematics in science: "Mathematics is to nature as Sherlock Holmes is to evidence....It is a more or less systematic way of digging out the rules and structures that lie behind some observed pattern or regularity, and then using those rules and structures to explain what's going on." The world of mathematics is a world of imagination and abstraction, where scientists explore the "what ifs" about nature, and many modern scientists are somewhat mellower about their belief in the absolute power of mathematics. But for those in the seventeenth century, who had just discovered its powers of explanation, mathematics supported their belief in objective deductive reasoning over intuition and experience. Through mathematics scientists reached logical conclusions about their observations. Add to this the belief that the world is a huge machine, whose mechanisms must be understood and explained in mathematical terms, and you have the scientific worldview of the seventeenth century: Nature is a huge machine that operates with order and precision, and whose understanding is accessible only to scientists through the power of mathematics. In other words, reality is not how you perceive it. It is mechanistic, mathematical, and removed from everyday experience. So, what was the impact of science's new view of itself and its knowledge on society? The immediate impact was probably minimal. Most of the people living in the seventeenth century were still relatively uneducated and not attuned to scientific thinking. But over time, as science, religion, and the state worked to balance their authority and power, they succeeded in creating and transmitting a worldview in which scientific discoveries were used to promote social order through the authority of the state and its ally, the Church. Scientific certainties dulled society's sensitivity to nature's wild side and supported the Church's view that man's wild nature must be controlled. The interweaving of scientific and religious views created a world of cause-effect thinking, belief systems, and institutions that were fixed and inflexible. It embedded in our European ancestors a belief that the world operates like a machine, with clockwork precision through a code of rules and consequences. It created a world of sameness -- predictable, controlled, known -- where acts of nature, plagues, social upheaval, and other forms of disorder were seen as aberrations in a world of order. In the next chapter we'll explore the reasons why we must give up our mechanistic constructs. And we'll see how the new science is freeing us from the straitjacket of linear thinking and giving us new ways to appreciate the relationship between order and the constantly changing world around us. 1. What is strategic thinking? Why is it important? What methodologies does your company use in its strategic thinking efforts? Have those efforts been successful? In what ways could your company's strategic thinking be improved? In your company, who is responsible for strategic thinking? 2. Describe the basic principles of mechanistic thinking? (Chapter 1, pages 38-50) Identify the ways in which your company's management and operations are based on mechanistic principles. What are the benefits and/or limitations of this approach? 3. What is the new science of chaos and complexity? (Chapter 2) In what ways might this new way of thinking about change be useful to you? 4. Identify other companies that have demonstrated industry foresight? What did they do that demonstrated foresight and what were the outcomes/benefits of their actions? How might the new science explain the dynamics at work in these events? 6. What is visual thinking and why is it so important? In what ways did visual images help scientists understand the dynamics of non-linear systems? (Chapter 4) In what ways does visual thinking facilitate strategic thinking? 7. What is the difference between forecasting and foresight? (Chapter 5, pages 107-112) What is a FutureScape™ and how could it be used to support strategic thinking in your business? 9. What new ideas, insights, questions or thoughts have you had as a result of this discussion? How will you continue your exploration and experimentation? Who else needs to read this book?